If it says “100% WHOLE GRAIN” on the front of the package you’re good to go. If it says any of the following on the front, it’s most likely not 100% whole grain, and you should move on. Beware of another common pitfall: In the ingredients they’ll list “Whole Wheat” first, and right behind it will be “Enriched Wheat Flour.” That second one is just another name for refined flour. Again, move on. Have you seen other label trickery? Post in the comments! (though in my opinion they don’t go far enough). 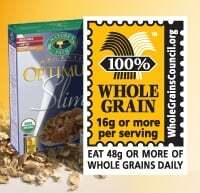 The Whole Grain Council’s Guide to Identifying Whole Grains. Good tips Andrew! One piece of label trickery that really bugs me involves trans fat. Lots of items claim to be trans-fat free, but in fact list partially hydrogenated oils in the ingredients. But because they have less than 0.5 g of trans fat per serving, they can round down to zero. Jerks. Do you have any good whole grain pastas to recommend? TJ’s has some, have you tried em? As for 100% whole wheat pastas, I’ve found that Whole Food’s 365 Everyday house brand is great, and (somewhat surprisingly), Target’s Archer Farms house brand makes a good one, too. Trader Joe’s definitely has a bunch, but I can’t for the life of me remember if I liked them or not. Guess that means they were, umm, beige. I’m just confused that it says enriched whole wheat. Is that a bad thing? Is that something to avoid? Any guidance would be appreciated. Hi Ayesha. Enriching isn’t necessarily a bad thing; they’re just taking the flour and adding vitamins and minerals to it. However, it’s unusual that they’re enriching whole wheat flour. We have enriched flours because the refining process strips the nutrients, so manufacturers are required (by law) to add some nutrients back in. It’s not usually done for whole grains. Odd!